A US publisher has cancelled publication of a Holocaust memoir after its author revealed that he had made up crucial parts of it. Herman Rosenblat did survive a German concentration camp, but he did not fall in love with a girl who threw him food over the fence, as stated in the book. Instead, he met her on a blind date in New York and married her 50 years ago. His book, Angel at the Fence, came under public scrutiny after a number of scholars questioned important details. The fabricated story says that when Rosenblat moved to New York after the war he met Roma Radzicki by chance and discovered she was the girl who had thrown apples and bread to him. They fell in love and married. But some questioned Rosenblat's descriptions of Schlieben - a sub-camp of Buchenwald - and said it was impossible to throw food over the fence there. The book was due to be published by Berkley Books, part of the Penguin Group, in February. Advance publicity had included a couple of appearances by Rosenblat on the chat show hosted by Oprah Winfrey. 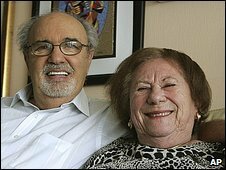 In a statement, Rosenblat, 79, said: "I wanted to bring happiness to people. "I brought hope to a lot of people. My motivation was to make good in this world." His agent Andrea Hurst told the Associated Press: "I question why I never questioned it. I believed it; it was an incredible, hope-filled story." A statement from Berkley said Rosenblat and his agent would be required to return "all money that they have received for this work", Reuters news agency reported. Historical records prove that Rosenblat was an inmate at Buchenwald and other camps. But Rosenblat's agent said the love story involving meeting his future wife through the fence when he was a teenage prisoner at Schlieben was invented. The Angel at the Fence is the latest in a series of high-profile literary fabrications. Earlier this year, a Belgian woman revealed she had invented her tale of survival as a Jewish girl searching for her parents with a pack of wolves in Nazi-occupied Europe. Monique De Wael, who adopted the pseudonym Misha Defonseca, admitted she was not Jewish and had lived in Belgium. And a memoir by a white woman that claimed she was raised in poverty by a black foster mother and sold drugs for a Los Angeles gang was also exposed as a lie after her sister contacted the publisher. Margaret B Jones, the author of Love and Consequences, actually grew up in a well-off area of California's San Fernando Valley. Meanwhile James Frey, another author championed by Oprah Winfrey, admitted he "embellished" his bestselling memoir about his battle with drug addiction, published in 2003.